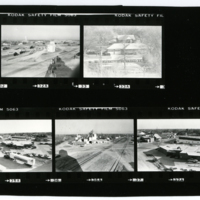 March 1987 -- View from top of Hesston Mill looking west. 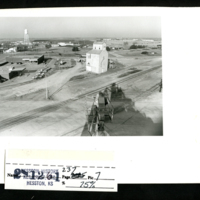 Left to right is: Hesston State Bank, Post Office and Sunglo Feed Co. grain elevator. 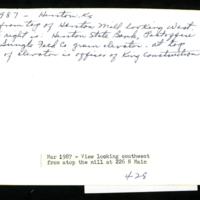 At top right of elevator is offices of King Construction Co.
Hershberger, D., “View of City Businesses ,” Hesston Public Library, accessed April 25, 2019, https://hesston.digitalsckls.info/item/1725.